We loved the Intel Core i7, it's dead fast and we gushed and fawned and scored it 4 1/2 out of 5. It was the first chip to be based on Intel's Nehalem (say knee-hay-lem) microarchitecture, and uses the Bloomfield core. This is a big deal as new Intel microarchitectures don't come along very often. All well and good but the chips and the motherboards aren't exactly cheap. Enter the next step down for the Nehalem core, code-named Lynnfield (a small Massachusetts town of 11,500 people, first settled in 1638, if you must ask). These Lynnfield chips are aimed at the mainstream desktop market. And we also get a new name: Core i5. Road maps we've seen show there will be three Lynnfield versions initially; running at 2.93GHz, 2.8GHz and 2.66GHz. The slowest one has Hyper Threading disabled. The 2.66GHz Core i5 750 is the most interesting of the three and is available for around £150. Coupled with cheaper motherboards it means you are able to bask in Nehalem goodness for considerably less than with the Bloomfield set. So how is the Core i5 crippled? You are a cynical bunny aren't you? Well, it's still a quad-core monster with 8MB L3 cache for a start. The most obvious difference is the change from a three to a two-channel DDR3 memory controller, not a crippling loss by any means. You also lose Bloomfield's QPI (QuickPath Interconnect), which offers some frightening potential bandwidths of 25GB/s. It carries DMI instead, which at 4GB/s sounds pedestrian in comparison, but QPI is something of an over-kill unless you have multiple physical processors or make very heavy use of PCI-e devices. The degradation isn't anything like as bad as the numbers appear to indicate. Core i5 CPUs also carry an integrated PCI-e controller so there is no IHC chip, which reduces the motherboard chipset from three to two, which shaves costs again. Other than that, its pretty much the same chip. However, not all Lynnfield core chips will have hyper-threading enabled. This is where the Core i7 and Core i5 brands come into play. 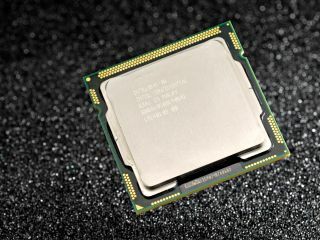 The 2.66GHz Lynnfield is now being sold as the Core i5 750. Every time Intel launches a new processor we get a new socket, again. Lynnfield gets LGA-1156 over Bloomfield's LGA-1366, fewer pins as it lacks the third memory controller even though the PCI-e bus adds a few too. Lynnfield's other sidekick is the new P55 motherboard chipset, and boards are ready and waiting in the wings from the usual suspects. It offers a welcome saving over the notoriously expensive X58 chipset used on the LGA-1366 motherboards. Regarding performance, it depends on the software you choose to run. In heavily multi-threaded applications such as video encoding, the lack of HyperThreading hurts performance by as much as 20 per cent. That said, this chip is still faster than anything AMD, Intel's main rival in the PC processor market, can produce. It's also significantly quicker than Intel's old Core 2 Quad CPU.. The steps taken to keep costs down clearly haven't blunted performance to any significant degree, unless you really start punishing the memory bus. Leaving hyper-threading off is less of a handicap than you may envisage for most tasks when you've got four cores to start with. There are, as yet, few everyday tasks that are going to send data down all eight threads consistently.